Globe Life Park Rolls Out Its Latest Outlandish Stadium Food Offerings, Deep Ellum Gets More Coffee (And Seafood) And Noble Rey Gets New Owners. Plus More! 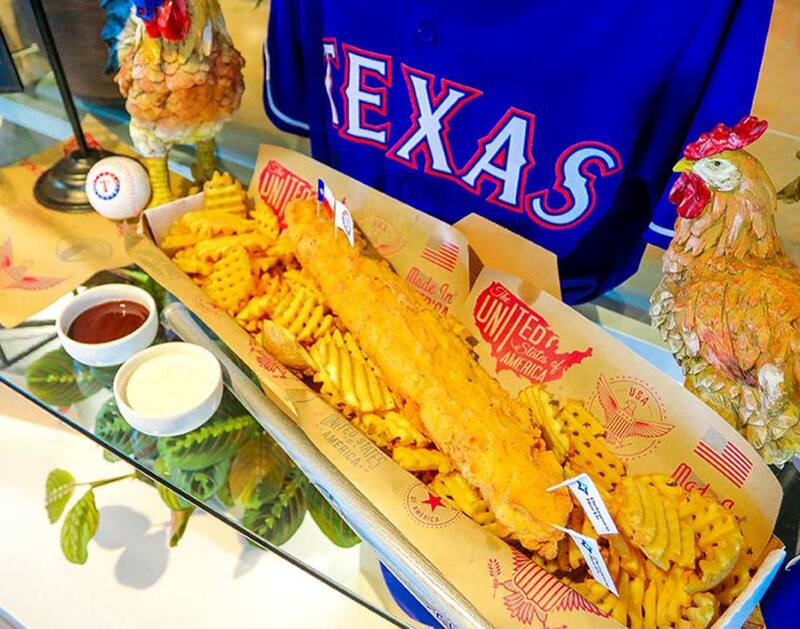 Batter up, y’all: It’s that time of the year when Globe Life Park rolls its latest roster of over-the-top stadium foods for Texas Rangers home games. As Eater notes, this year’s lineup of its annually stomach-rupturing offerings include such clean-up hitters as a two-pound chicken tender (served on top a bed of waffle fries and with a side of ranch), bacon-wrapped chicken wings, a Texas-chili flavored red, white and blue hot dog, and a deep-fried PB&J for those of us who want to taste some sweet nostalgia but would prefer to do so with an increased risk of clogging our arteries. To be fair, not everything being added to the ballpark menu is inherently bad for your health. Delaware North, the company behind the stadium’s concessions, is also adding vegan options to its card — among them street tacos and burgers, both of which will be made with Beyond Meat proteins and vegan cheese, and a fresh veggie wrap complete with squash, zucchini, carrots, tomatoes, lettuce and Italian dressing inside of a tortilla. The new offerings will be made available all season long, starting with the baseball season’s opener this Thursday, March 28. In more poultry-related news: CultureMap notes that another outpost of Chicken Salad Chick has hit the region, this time setting up shop in McKinney. Located at 3520 West University Drive near US-75, the opening marks the fourth area restaurant for the Alabama-based chain, as well as its third to open in Texas this year. The menu offers a variety of — you guessed it — chicken salads in various original flavors, sold by-the-pound and customizable with a bevy of ingredients. The spot’s also got a solid selection of sandwiches, soups, side salads and desserts for diners to choose from. Hours run Mondays through Saturdays from 10:30 a.m. to 8 p.m.
Another newcomer to McKinney that CultureMap’s got the beat on is the Iowa-based Mexican chain Pancheros Mexican Grill, which is setting up shop all of four blocks away from Chicken Salad Chick at 3905 West University Drive. More area locations are expected to follow, including an outpost set for 3275 Regent Boulevard, as noted by the brand’s own website. More on the fast food end of fast-casual, Pancheros focuses on simple, yet familiar favorites such as quesadillas, tacos, burrito bowls, salads, chips and queso, plus other limited time offerings. Hours are 10:30 a.m. to 11 p.m. Sundays through Thursdays, and from 10:30 to midnight Fridays and Saturdays. Speaking of suburban additions CultureMap’s got the scoop on, a new vegan concept called Itso Vegan is gearing up to dish out soul food and Mexican-inspired fare in Grand Prairie. The restaurant, found at 830 Mayfield Road, has apparently proven to be so popular since its soft opening earlier this month that it’s had to shut down a few times due to lack of food. We’re not entirely surprised, consider the spot promises such dishes as chicken and waffles made with seitan chicken and banana-flaxseed waffles, BBQ jackfruit sliders and something called a “nothing-from-the-sea-food-platter.” You can check it out between 10 a.m. to 8 p.m. on Tuesdays through Sundays. Rounding out CultureMap’s sheer dominance of the national-chains-hitting-the-Dallas-suburbs beat this week, Teresa Gubbins also notes that Philly Pretzel Factory is slated to hit Richardson in late spring 2019. This outpost of the Pennsylvania-based chain will feature a solid selection of pretzel offerings, including but not limited to pretzel sandwiches, cinnamon-dusted pretzels served with sweet cream cheese dip, in addition to other more traditional pretzels in various sizes. Word has it the local franchisee for the Richardson location also has plans for a Plano store, and that too is likely set to open in 2019. Moving back within city limits, Eater notes that The Crab Station is expanding into Deep Ellum with a new outpost at 2813 Commerce Street. This location marks the eighth in the state for the chain, and while there’s no word yet on an official opening date, we suggest you get ready to start cracking some shells come late May. Killing it with Deep Ellum news this week, Eater also notes that the San Antonio-based Merit Coffee has finally opened this week following an extensive build-out. The 2339 Main Street location — right by Jade & Clover and BrainDead Brewing — is the first of the brand’s outposts to hit the area, although it will be followed shortly by another location at 4228 Oak Lawn Avenue in Highland Park that’s set to open on Tuesday, April 2. The Deep Ellum shop is currently open Mondays through Wednesdays from 7 a.m. to 9 p.m., and Thursdays through Saturdays from 7 a.m. to 10 p.m. Following up on last week’s reveal that the Plano-based Press Waffle Co. was going to be on Shark Tank over the weekend, GuideLive notes that the waffle concept landed a $300,000 investment with real estate mogul, Barbara Corcoran in exchange for a 15-percent stake in its company. The investment will help to fund a national expansion, with Press Waffle Co. eyeing on franchisees outside of Texas. To celebrate that investment, perhaps the siblings behind that would enjoy a cracking open a cold one with the boys? They’ll certainly have plenty of opportunities to do so, with three big beer events taking place around the region this weekend. First up is the annual Big Texas Beer Fest, which is going down on Friday, March 29, and Saturday, March 30. The indoor/outdoor festival at the Fair Park Automobile Building will showcase more than 400 beers from around 100 breweries spanning the local, national and international circuits. Tickets range from $35 to $60, with the event’ hour running from 2 p.m. to 6:30 p.m. each day. Then, on Sunday, March 31, Peticolas Brewing Company is just one of many area businesses hosting Selena Quintanilla-themed events this weekend. The brewery’s second annual Selena Brunch will honor of the 24th anniversary of the Texas legend’s death with a beermosa and Michelada bar, alongside bites from Tutta’s Pizza and Easy Slider. The event won’t take place late at night when all the world is sleeping, though; its hours will run from noon to 6 p.m.
Also on Sunday, March 31, Four Corners Brewing Co. is hosting the Dallas Donut Festival where, in exchange for a $35 ticket, attendees get doughnuts from each of the event’s 20 vendors, plus a drink ticket from Four Corners. Oh, and coffee samples! The event lasts from 1 to 7 p.m. Finally this week, we too will note as many others have that Noble Rey Brewing Co. released a statement this week about the fact that it’s shuttering its Dallas operations on March 31 in the wake of bankruptcy filings back in December — but we, on the other hand, will also immediately point out that, for all intents and purposes, this closure appears to only be temporary, as new ownership is slated to take over operations come mid-April. Of course, you wouldn’t necessarily know that by the headlines posted all around town this week in regard to this news, but whatever! Cover photo via the Texas Rangers’ Facebook page. 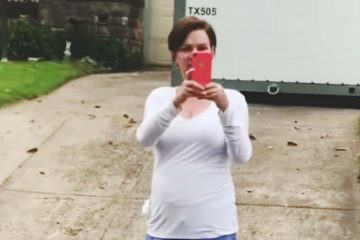 Got a tip for The Spread? Email us! Previous ArticlePlaying Games: Yella Beezy Shows Us How He Rolls. Next Article45 Things To Do In Dallas This 214Selena Weekend.